$2 per letter for his last name! “What do I look for in deciding whether to pay for a signature? How tough the signer is otherwise, and how reasonable the fee is. One can find some good bargains in Harvey Meiselman’s list of signers. HOFer Don Sutton @$5 a card, Reggie Cleveland and Kevin Elster @ $1 a card, Larry Gura $2 per. I’ve never had a problem sending cash by mail, but I don’t send large amounts. Anything bigger merits a money order or check if they’ll accept it. I weigh the price on the player and how bad I want him in my collection. Quite a few years ago I paid $5 each for two Dom Zanni autographs. Now he’s charging $30. Now I’d pass. 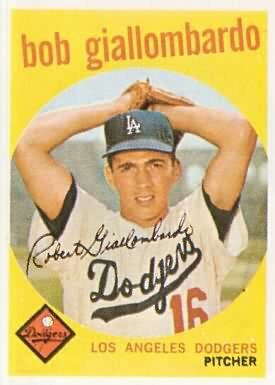 Even worse is Bob Giallombardo’s $25 (double his amount of major league games, and Bob Allen’s $100 fee to sign a card (postal money order only). This is either a joke gone awry or an extremely unrealistic request. Tomorrow: The amazing mission of pitcher Larry Gura! He told me on the phone to send him a card and he’d sign it. He even gave me his address. I sent him the card and the article. Six months later I had no response. He never mentioned anything about a fee. I sent a follow-up with another copy of the article and a small photo and again he kept it. I know these players don’t owe us anything, but he could just return the items unsigned. I have been looking for a Giollombardo autograph for some time now and have not seen a single one listed on ebay. If he actually signs for $25, I would probably pay that. I bet if his 589 Topps card showed up signed on ebay, it may easily exceed that as I know I am not the only fanatic Dodger auto collector out there. I agree with you though. Giollombardo’s career doesn’t warrant a $25 fee, but the scarcity he has created does apparently.